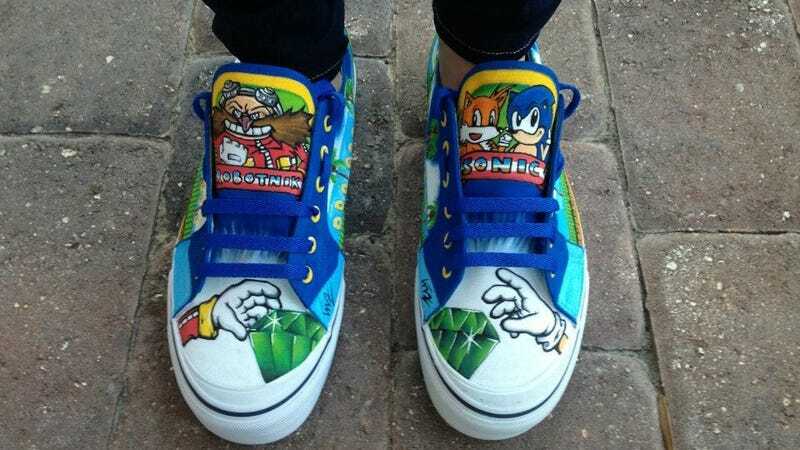 Reddit user lumpyheadedbunny drew these awesome Sonic 2-inspired kicks with graffiti pens. My first thought was that it must have taken her awhile, because you can see how much detail went into the drawing. They're expensive ($350+), but LHB puts a lot of time and effort into her creations. Each pair takes roughly 45-65 hours to make. She provides all the materials (which, if you peruse Etsy as much as I do you'll know that many creators ask you to provide the shoes yourself). But the best part of this deal? She guarantees lifetime touch-ups for free. That's a pretty great seller-customer relationship if you ask me. Although she currently does not have a website up to take requests, you can find more pictures here. UPDATE: Creator Lindsey Gunsallus has recently posted a Facebook fan page where you can be sure to learn of her updates as they are made available. You can also keep a watch on her newly establish blog, which I'm told will feature new posts and potentially some promotions soon.